Analyzing real estate investment deals really starts with determining the sellers ‘situation’. Every seller has a situation and your goal as a real estate investor is to find out what it is. The seller’s situation not only determines how you will purchase the property, but also your exit strategy (how you will sell the property). This is known as the… Real Estate Strategy. It’s common that most investors only utilize one real estate strategy which limits how you can purchase and sell real estate. Having multiple solutions for the seller will increase your acceptance ratio of Yeses. Not only giving you a better chance of acquiring the property, but selling it too. We all start off with one strategy, but in time, you should learn them all. Let’s say that you find a potential deal and determine that the seller is getting a job transfer. Now, most sellers would love to be cashed out and be done with the property. But, what happens when it doesn’t sell? The seller will most likely rent the property out and become a landlord. Here, you have multiple solutions you can present to the seller. Is the seller open to a cash discount? If so…you could potentially wholesale or retail the home. Is the seller open to ‘terms’? Meaning, will they accept monthly payments for a short period of time, then be cashed out? If so, you can offer a Lease Option or Seller Finance. With these strategies, you can pay the seller more on the sales price because you would be purchasing the property on, ‘terms’. Terms is where you make your money. How much down, monthly and the backend sales price. Note: you’ll profit 3 ways on every deal. As you can see, you now have multiple ways to purchase the property as well as selling it. Again… it all depends on the sellers ‘situation’. You are either buying the property with a cash discount or terms. But… why not offer all 3 at the same time? Here, you’ve given the seller multiple offers and more options on how they can sell as well as giving you a better shot at getting the deal. Now, we can now start to analyze and run the numbers for all 3 ways to purchase and sell the property. Since there are thousands of ways to run the numbers, you need a calculator to run all scenarios. This is where DEALPro comes in. 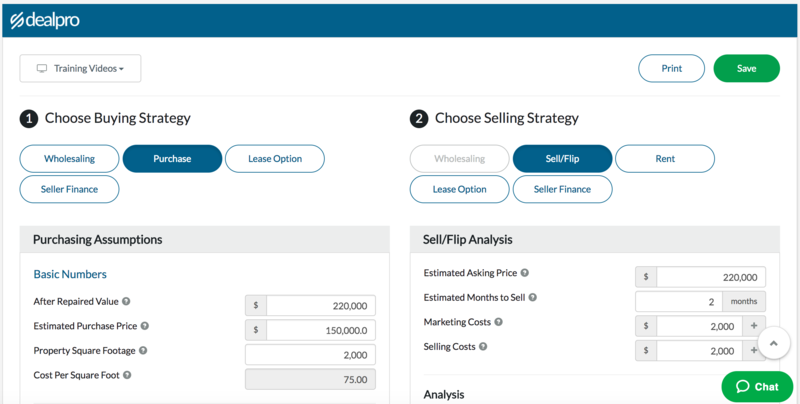 DEALPro is now helping others do the same thing, by analyzing thousands of scenarios, to help you determine the best and most profitable way to buy and sell houses. Making the correct offer is one of the most important steps, and DEALPro does it with ease. You can run the numbers for every type of purchase strategy to exit strategy including Wholesaling, Lease Options, Seller Financing, Cash Purchasing, Traditional Financing, Private Financing, Hard Money and Rentals. See how much you can make with every deal in seconds. Click here and start your 30-day free trial. It will be worth your while.